A sense of adventure underpins the extraordinary story of Zhong Chen which usually begins at the moment he arrived from Zhongshan in Adelaide at the age of eighteen. In just six years the artist would graduate with Honours from the Adelaide School of Art and win the highly coveted Samstag award, a scholarship to the Chelsea School of Art in the UK. 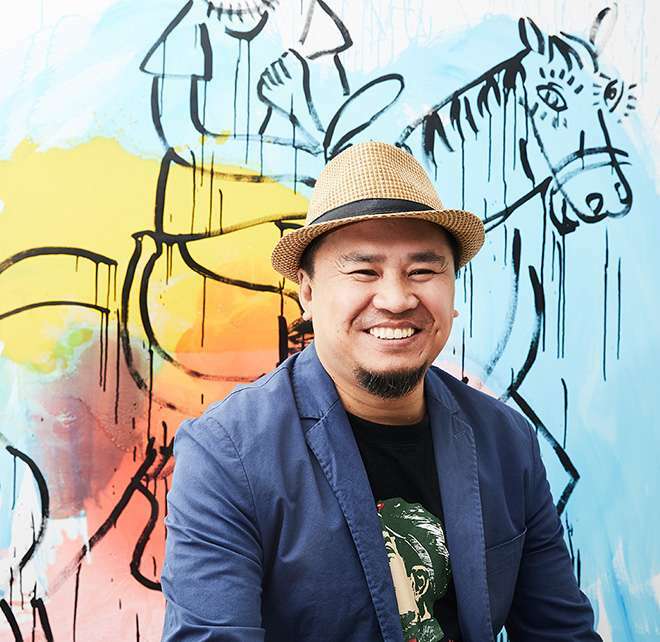 Although Zhong’s journey to Australia has been a crucial part of his identity, an understanding of his steadfast gravitation to art is also key to understanding this singular artistic project. Born in Zhongshan, China in the pre-boom era of 1969, Chen first discovered art through the lens of traditional Chinese calligraphy when, in the early eighties, his mother enrolled him in calligraphy lessons. A defining moment for the adolescent was a trip to Northern China to visit an international exhibition of contemporary Chinese calligraphy. It was from these experiences that the young artist decided to broaden his world and pursue art. When a plan to live in America was stymied by his grandfather’s concern about an uncle’s wayward habits, Zhong travelled to Australia. In 1989 he arrived in Adelaide to live with family friends who were also recently arrived immigrants. He first studied art in the TAFE adult education system and soon after proceeded to complete the Honours degree that would propel him to the Chelsea School of Art in London. We see many different styles in his output: series that span the breadth of traditional European genres of landscape and portraiture as well as the contrasting pixelated compositions of Chinese women. The range of influences span cultural histories from China, Australia, Germany, USA and the UK. We discover hallmarks of Pop artists such as Michel Basquiat and Andy Warhol as well as influential international artists from the nineties such as Elizabeth Peyton and Gavin Turk. Despite this, Chen’s early embrace of ink brush painting is never far from the surface. In works at The Chen we see a playful, gestural style in paintings of watercolour, oil and acrylic. There is a cartoonish element immediately apparent through the bold black outlines of the figures. The black outlines provide a marked contrast to the softer tones of watercolour that is unevenly absorbed through the paper. There are also popularized aspects of Chinese culture, such as Kung Fu. Drawn from China's great classic novel the Water Margins (or Outlaws of the Marsh), this fourteenth century story concerns the adventurous tales of harsh feudal conditions in the twelfth century. In a series of Chinese landscapes, Chen tests the limits of difference between contemporary and traditional painting. Since graduating with Honours from the Adelaide School of Art in 1995, Zhong Chen has continued to complete a Masters of Fine Arts at the Chelsea School of Art in 1998. He has exhibited in solo shows at Eva Breuer Gallery, Sydney; Hill-Smith Art Gallery, Adelaide; and Metro 5 Gallery, Melbourne. Key group exhibitions include: The Archibald Prize, Art Gallery of New South Wales (2011, 2008 and 2007); The Arthur Guy Memorial Prize, Bendigo Art Gallery (2005); and Xin Nian-Contemporary Chinese Australian Art, Sydney, Melbourne and Washington (2004). Chen was also awarded two Australian Council grants to participate in residencies in New York in 2001 and 2006. His work has been widely collected in Australia, Japan, Hong Kong and China. Key institutional collections include, The Art Gallery of South Australia, Gold Coast City Art Gallery, Artbank and Macquarie University.